We have been manufacturing our standard plastic bag dispenser XE/035 for about 20 years now, ever since supermarkets started using rolls of plastic bags. Although the basic design has received a few changes over the years, they are basically the same as they always were. This model was designed to fit a wall or other suitable vertical surface and hold a standard roll width roll of bags. The major change that has taken place has been the need to mount the dispenser in different places. Because of this, we now manufacture a number of types of dispenser, however, this seems to be creating some confusion for our customers as to the type required. To try to overcome this problem, shown below are the different types and some details about them to help identify the model required. Similar to the standard type but designed to be fitted to the underside of a horizontal surface. Nylon coated. The same as the XE/034 but with longer legs to bring bag support bar down 340mm from the mounting surface. 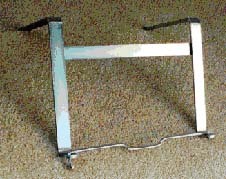 For mounting under canopy etc. Designed to hang over the front of produce refrigerator cabinet canopy. Chrome plated. 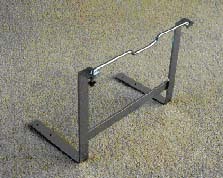 This is the same dispenser pictured above but assembled to be mounted on top of a horizontal counter top.